I know I'm only on my eighth book of the thirty Whitney nominees, but I'm beginning to notice some trends: this is the second book that explicitly relates to the massacre at Virginia Tech (also Altered State), the second book with a female protagonist who dealt with a major life tragedy approximately two years earlier (also Methods of Madness), and the second book with a major male lead named Tristan (also Illuminations of the Heart). It's at least the seventh book with unfathomably gorgeous main characters too. I don't think I'll be escaping that one anytime soon. I need to read some books about ugly people after I finish these, just so I don't have to read about handsome faces and gorgeous physiques anymore. Gag. 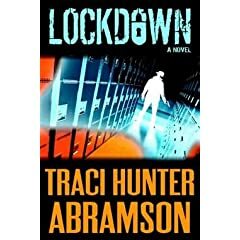 Lockdown is the story of Riley Palmetta, a woman finishing up a master's degree in criminal psych at the school where she was one of three people in her classroom to survive a massacre while she was an undergrad. She's assigned to work with a group of LDS Navy Seals (aka "the Saint Squad") in training groups of law enforcement officials in how to minimize tragedies in future school massacres. However, a school massacre is brewing at the high school just down the street. I'll admit that this story kept me reading. I never felt like I wanted to throw the book across the room, and while I've felt compelled to push myself through several of the books I've read so far, I actually looked forward to getting back to this one. I'm not exactly sure why. Riley and Tristan in Lockdown could be fairly easily interchanged with Emily and Zach in Methods of Madness or Natalie and Hans in Tribunal or even Alma and Maia in Alma, so I don't know if it was the characters. And it certainly wasn't the originality of the love story, or even, for that matter, the originality of the main story. But for some reason I still liked it. But I also felt like Lockdown couldn't decide what kind of book it wanted to be. In many thriller-type books (think Grisham or Baldacci), I'd say that the book is about 80% thriller and 20% personal interest/romance. In Lockdown, it's the opposite: it's really the story of Riley and Tristan falling in love, with their work providing a backdrop. And even though that was interesting to me, I'm not sure it would work for a larger audience, especially a male audience who might be prepared for more action and less, well, action of another sort. And the ending is impossibly cheesy. Gag. But what can I say, I'm a sucker for two people falling in love, so it was fun for me to read, although I'd be hard pressed to say it's a good book. 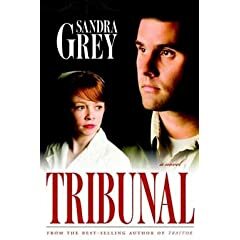 If I hadn't been compelled by this Whitney thing to read Tribunal, I can state unequivocally that I never would have read the book. The cover is just too creepy and weird, like a bad Olan Mills engagement photo from the 1970s. Ew. It's also a sequel (to last year's Traitor), and I tend not to like to read books in a series out of order. Tribunal is the story of Rolf and Hans, best friends and former Nazi soldiers after the end of WWII. Rolf's in bad shape after getting out of a concentration camp (where he was sent for being a traitor to the Nazis), and his friend keeps him company while he recovers, and falls in love with Natalie, Rolf's nurse. Natalie manages to get Rolf's fiancee back to his side, and from there the story gets too complicated to recount. As a story, it's interesting and fast-paced, and seems well-researched. The love stories and the LDS conversion stories are fairly predictable, but not annoyingly so. It was a little bit hard to jump into the story in the second book, and even toward the end of the novel, I still felt like I was missing bits and pieces that would have been helpful to the story. Overall, I liked the book, but I doubt I'd go back and read Traitor, which means I didn't love it. 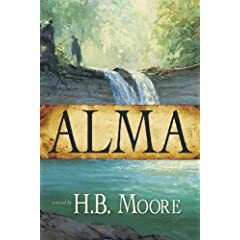 Alma is historical fiction; the story of, well, Alma from the Book of Mormon. So for many readers, Alma is a familiar story, just fleshed-out a lot more than we get in the five or six chapters from the Book of Mormon from which it is drawn. As a historical novel, it's the sequel to Moore's Abinadi, published in 2008. It's along the same lines as Orson Scott Card's books Rachel and Sarah, or Anita Diamant's The Red Tent. I didn't expect to like Alma (although I'm not really sure why, since I liked the Card and Diamant books). I think I thought it was going to be too similar to Tennis Shoes Among the Nephites (which, incidentally, I also liked) but I have to grudgingly admit that I did like the book quite a bit. I was interested in the story, and I think Moore did a good job of turning names from a book of scripture into believable characters. I particularly liked the way that the story was told from the perspective of the women of the community, since women are so glaringly absent from much of the Book of Mormon. Yeah, she did go a little heavy on telling us how attractive everyone was (apparently all Nephites are beautiful, I guess, unless they got too close to a fire as a child), but I could excuse that because the story drew me in. Also, this is one of three sequels that I've read so far, and of the three, I felt least lost reading Alma, which I think is another plus. Strange things are afoot on the campus of Utah State University. Seemingly-normal students have been falling into trances around campus landmarks, and Professor Morgan Winegar wants to know why. We, the readers know that the trance is induced from the combination of a drug (administered through an energy drink to unwitting drinkers) and a musical trigger. 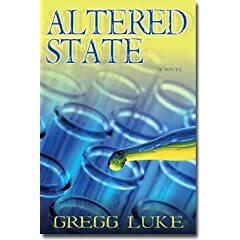 Lucky for Winegar, she happens to have a crack team of professionals to help her with her job: a husband who works for a science lab, an autistic son who can hear the subliminal messages contained in the music, smart cops, a PhD researcher for a bishop, and a TA who wants to do the right thing. Altered State isn't a mystery: we know from the beginning who is responsible for the experiment and how it's being carried out. Instead, it's a race against time to see if Winegar and her peeps can figure out what's going on before something really, really bad happens. So what makes the story interesting? (And yes, I did consider the book pretty interesting and entertaining.) Well, all of the girls are model-gorgeous and all of the guys are slightly dorky and may or may not have bad accents. But Morgan and her husband Homer are pretty well-constructed as characters. She's a good Mormon with a past, and he's a good Mormon with a past. We learn a lot about hers, but only a little bit about his, and unlike his wife, I would have pushed him to tell me more. But all in all, pretty good book. 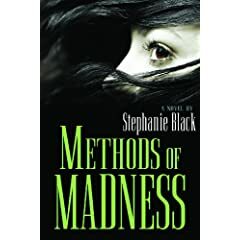 Methods of Madness is what I thought most of the Whitney books would be: books by Mormons about the Mormon experience. None of the first three books had LDS characters or would have been overtly recognizable as a book about Mormons, and that surprised me a little bit. Anyway, in Methods of Madness, first-grade teacher Emily Ramsey is the unluckiest girl alive. Three years ago, at her combination bridal shower/birthday party, her older sister Tricia got killed by a hit-and-run driver while trying to tie balloons to a lamppost. That same night, Emily's fiance Ryan disappeared, never to be seen again. It's taken some time, but Emily managed to pull through. She just agreed to marry Zach, a math teacher, but as soon as she says "yes," strange things start to happen: Zach's old girlfriend decides she will stop at nothing to get him back, a stalker makes Emily wonder if she's losing her mind, and more people turn up dead. As far as the mystery goes, I guess the story itself is okay. I didn't guess who the murderer was, and there's quite a bit of suspense. But there were also some significant problems with the book. First of all, I just didn't care about the characters, especially Emily and Zach, who were so flat and Molly Mormon that I wanted them to bust out and do something interesting. Instead, they seemed like stereotypes of what singles wards are full of. A couple of days later, the only thing I remember about Zach is that he was unusually skinny, and the only thing I remember about Emily is that she had an unnatural affection for Welch's grape juice. Some of the secondary characters were more interesting (most memorably Emily's mom, who cooked all the time-- is that also a stereotype?). The other problem was that the story was mostly told from Emily's perspective (third-person omniscient, but we hung with Emily most of the time), which seems weird for a mystery. It's fairly uncommon for the story to be told from the point of view of the victim, and I don't think it really worked here. Just some other picky things: is anyone ever unattractive in an LDS book? Are our singles wards full of skinny auburn-haired hotties? Not in my experience, but that's what the books I've read so far seem to think. Everyone is beautiful and we know that because the authors tell us. I want some normal protagonists who don't fall into sacrament meeting from the pages of sacrament meetings. Finally, a spoiler: the villains in the book are the ones who are either not LDS or not following traditional LDS roles. The main good Mormon characters come out of things squeaky-clean, as per usual. Not sure how I feel about that. 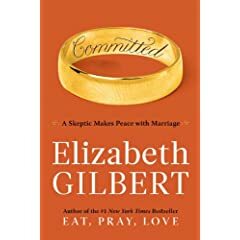 After finishing Illuminations of the Heart, any book would have seemed brilliant in comparison, but I think I would have enjoyed Elizabeth Gilbert's Committed even if I hadn't just finished one of the most painful books I'd ever read. If you, like most American females of a certain age, read Eat, Pray, Love in your book club a few years ago, you'll probably remember that Liz fell in love with Felipe in Bali (the "Love" section), and they promised to spend the rest of their lives together in unmarried bliss. The only obstacle to their happily ever after turned out to be the Department of Homeland Security. After a couple of years of spending time with Liz in Philly and leaving the country only to renew his tourist visa, the government cracked down and told Felipe that he couldn't come back unless he and Liz did exactly what they didn't want to do: tie the knot. In the year that they worked out the legal red tape of the situation, Liz and Felipe traveled through Asia, living on the cheap, and Liz read everything she could do help herself come to terms with jumping back into the institution of marriage. While Eat, Pray, Love was more of a standard memoir, Committed is only sort of a memoir. It's a lot about Gilbert's responses to the interesting things she read about marriage, with events from her own life and the lives of people in her family and people she interviewed while traveling around Asia to highlight the topics at hand. Sometimes she rants, sometimes she shows her prejudices and her personal world-view, and sometimes she whines at the unfairness of her situation. But overall, she shows her love both for the examples of people who taught her how to love, and, most importantly, for Felipe. I feel like my review of this novel needs to come with a disclaimer: I do not read romance novels. I mean, I've read one or two in my life, but probably not in the last two decades. As a genre, they don't do it for me: they feel too predictable, too formulaic and too gag-inducing. And to be fair to Ms. diPastena's novel, this is the first of the five novels in the romance category that I read, so I don't have anything to compare it with. Now that the disclaimer's out of the way, I'll just say it: I HATED this book. It was obvious at the end of the first chapter what the inevitable outcome of the book would be, but it took 425 pages for the protagonists to end up in one another's arms. And those 425 pages were so rambling, so full of unnecessary overdescriptions, so riddled with minute plot twists that kept the action moving forward at a snail's pace that I heaved (see, romance novel word!) an enormous sigh of relief when I finally finished the book and flung (ooh! another one!) it into my backpack. So you want a summary? 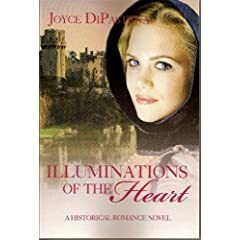 Siri ends up in 12th century France in the custody of Triston, a minor nobleman, after her whole family kicks the bucket in Italy. She's hot for Triston, and he's hot for her, but she looks uncannily like his dead wife, and half of the nobles in rural France have lined up to ravage her. So he has to protect her honor, and she has to make him fall in love with the woman she really is. Sounds terrible, doesn't it? I promise you, it is. I finished reading this book and wondered how it ever found a publisher, and, more importantly, how it found 13 people at Amazon to give it an average of 4.5 stars. But again, I'm not a romance reader. Maybe I'll be able to give a more accurate assessment once I've read all of the romances in the category. But I will be depressed as hell if this is the best of the bunch. Think Romeo and Juliet, Seattle Asian-style. Henry and Keiko meet as the two Asian scholarship students at their all-white elementary school, just after the bombing of Pearl Harbor. They fall in love, she gets sent away to an internment camp. He promises to wait for her and love her forever. Then, forty years later, newly widowed and lonely, Henry can't keep his mind off of her. I liked the book. It's a good book club book (my book club is discussing it tonight, in fact, and I finished with hours to spare), because it's relatively short, easy enough to read, and the writing is pretty. It also ends happily, which I like every once in a while, and I think it worked well here. As a Whitney nominee, The Hotel on the Corner of Bitter and Sweet is an interesting case. It's probably the most famous book this year (with the possible exception of Fablehaven), printed by Random House. It's a New York Times bestseller, and Ford is a debut author who grew up in Seattle's Chinatown and now lives in Montana with his wife and six kids. Other than the six kids and very subtle things like a minor character named Palmyra, there's nothing overtly Mormon about the book. None of the characters is LDS. Last year when I interviewed Marilyn Brown for Segullah, she talked about how it was a dream of hers to see LDS authors writing for a mainstream audience, but that few were able to do it successfully. I think Ford is successful here, but without engaging his religious history (he does engage his ethnic history). It's a sweet love story, if somewhat self-consciously descriptive with the writing at times, and I enjoyed reading it a lot. P.S. I got a new computer yesterday. It's my first mac, and I have no idea yet how to copy images from amazon and insert them into a post. So until I figure it out, this post will be photoless. 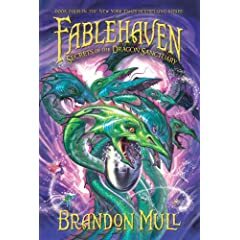 Although I've heard a lot about Brandon Mull's Fablehaven books, read chapters from them to my kids, and even helped those aforementioned children write book reports about them, this is the first time I've actually read one in its entirety. So if you're a huge fan of Fablehaven, keep in mind that I can't draw from the stories of the first three books. Mull seems to assume that most of his readers read forward from the first book; it wasn't until I was about 300 pages into the 544 page story that I felt like I fully understood what was going on, which made for somewhat slow reading for a YA novel. I don't know how that should figure into my vote. As for the story itself, it was pretty entertaining. It took several chapters and two dead Kendras for the Fablehaven crew to reassemble over the holiday break. Once they got together, they made a holiday visit to their neighbors, the centaurs, Seth snuck away a few times, and they talked strategy. Lots and lots of strategy. So much strategy that it was painful at times. Then they headed north to a dragon preserve, in hopes of getting to a precious treasure before their enemies did. That's when the book got fun. Traveling with gryphons and dragons and giants is a lot more interesting than sitting around a room and talking strategy. One of the things that felt least "real" in the novel (and I know that it's a fantasy) is the way that Kendra and Seth's parents were completely absent. They thought their daughter was dead, they let their son spend the holidays with his grandparents, and then they were written out of the story. Mull does a great job characterizing dragons and giants, but when it comes to fleshing out the parents, it felt like they were almost intentionally left two-dimensional. So the conclusion of the book (and I'm not going to spoil things and write it out here) didn't have the emotional impact it might have if they had been more fully realized. And one more picky thing. The word SUV appears way too many times. I think it's appropriate to use "car" as a synonym instead of calling the vehicle an SUV over and over again. I know that's probably me being crabby, but it still irritated me. 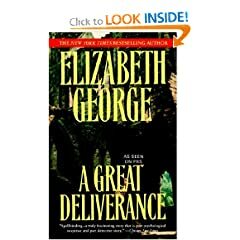 I've heard fantastic things about Elizabeth George's series of mystery novels with Inspector Lynley and Barbara Havers, but I'd never read any of them. So I picked up the first three in the series, and sat down last week with the first one, A Great Deliverance. I should have really, really enjoyed the book. It's right up my reading alley, and George does a good job of creating a main body of characters from Scotland Yard that seem possible to care about beyond one novel. So I'm chalking up my less-than overwhelming enthusiasm for the book to my own crazy life or something other than Elizabeth George. The main premise of the book is that a Yorkshire woman is accused of beheading her father, and Scotland Yard sends Thomas Lynley, a dashing upper-class Brit, and Barbara Havers, his junior partner, from a troubled working-class background, up North to investigate. But they discover as much about their own inner struggles as they do about the struggles of the deceased and his family. I'll definitely give the Inspector Lynley series another go, but this one didn't hold a candle to PD James, even though the lead investigators seemed plucked right from one of her books. For the last couple of years, Segullah has had a vote for the Whitney Awards. Last year, Emily Milner did an amazing job reading the books and voting on our behalf. This year, she asked me if I wanted to share the power (responsibility? burden?) of voting with her. I eagerly accepted, and then quickly realized that along with the power comes the requirement that over the next six weeks, I have to read thirty books. I'm excited about the prospect, because as much as I love reading contemporary fiction, I've barely scratched the surface on Mormon publishing and contemporary fiction for a Mormon audience, and this feels like my baptism by fire. So I unloaded all of the books I'd been planning to read in Hawaii from my suitcase, and filled it instead with Whitney nominees. 30 books in 45 days feels like a huge challenge, but I always love a challenge. The blog will probably become a dumping ground for my thoughts on the Whitney books, so you'll get to take the inside scoop here. My sweet Annie girl turned eight this week! She's getting so grown up. To celebrate, we had a family birthday on Tuesday and on Friday night she took three friends and her cousin Natalie out for pedicures and dinner. We had an awesome time. Here's the proof! I fell hard almost exactly a year ago. I clicked on an email link, pictures came up, and it was love at first sight. A month later, I met my love in person, and it was obvious that we were a perfect fit. Our family and this house, I mean. And as soon as we signed the papers and formalized our relationship, I started planning for our future. One of the first things I did was pick out a couch for the family room. Over the last six months, you've seen lots of pictures of the house: bookshelves and plate walls and slipcovered living room sofas and bedrooms of all kinds, but no new family room couch. That's because the couch I picked out, a lovely custom sectional from Room and Board, costs what feels to me like an obscene amount of money. And while we've spent money here and there on the other rooms, they've been bargain finds-- picked up from Craigslist and Overstock and IKEA, five or fifty or a hundred dollars at a time (not that the bargain finds don't add up, because let me assure you that they do). The only thing we've spent a lot of money at once on was our mattress, and even that cost only 1/4 of what the couch will set us back. So anyway, we've deferred, saying that when we got our tax return, that would be couch money. The taxes are filed, the money should be forthcoming, and after waiting and talking ad nauseum about the darn couch, I'm not sure I can bring myself to order it. Twice in the last week, Maren has taken a pen to our current, much-worn and much-disparaged couch set, the couch set that screams out to be in a basement, or at least screamed out, until it was covered in fuschia marker and black pen and I blew out my child's eardrums with my yelling. Because if I can't even protect my crappy couches, now not even fit for our playroom, then how the heck am I going to keep what has become my platonic ideal of a perfect couch pristine and perfect amidst the chaos of my life? If I scream bloody murder at my three-year-old when she scribbles on my crappy couches then what am I going to do when she does it to the new one? Maybe I like the couch better in the catalog than in my family room. 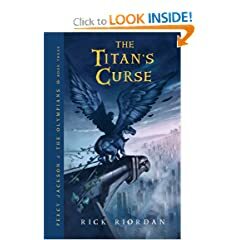 I started this book last night after the kids went to bed and finished it this morning before they were up, so Rick Riordan's The Titan's Curse is definitely a page turner. It's the continuing saga of Percy Jackson, the half-human, half-Greek god kid who attracts trouble like moth to a flame. In this installment, he's off saving yet another friend from yet another crisis situation, once again traversing the country and finding out that there's a lot more supernatural stuff out there than he ever realized. I don't have a lot to say about the book other than that I enjoyed it and my nine-year-old did too. I'll continue with the series because they're fun, quick reads, and they make me laugh. But they are what they are-- books written for pre-teens. I've been reading so many quick and easy books lately (like the Percy Jackson series, written for fourth-graders), that I groan a little bit when a book that might present a bit of a challenge shows up on the top of my pile. I was actually planning to return The Big Burn to the library unread, but I decided to give the intro a chance and I was hooked. The title of The Big Burn may include Teddy Roosevelt's name, but it's less about Roosevelt than it is about the history of forestry in America, which means it's about the creation of the national parks, the birth of the forest service, and about Gifford Pinchot, who was America's forester in chief during the formative years of both. The early chapters of the book were a little bit slow-going (there's nothing I like to read about less than politics, especially the underhanded politics of a century ago) but Egan had to set up the political landscape in order for the story of the fire to make sense: Roosevelt claimed land for the national government over the loud protestations of his fellow Republicans in Congress (many of whom had interests in logging, mining, and railroads), Pinchot established a fledgling forest service, but when Taft replaced Roosevelt in the White House, opposition threatened to undo the work both men had done in the name of conservation. Then, in the summer of 1910, an enormous wildfire whipped through Idaho and Montana, burning an area about the size of New Jersey, and establishing the forest service as an important entity in the United States. The book reminded me a lot of Erik Larson's Isaac's Storm, with background laid building up to the cataclysmic event. The strength of the book lay in the personal stories of those involved in the fire-- the firefighters and cooks and ordinary housewives whose stories became part of the legend of the fire. Then Egan wraps up the story relatively quickly, saying that the big burn shaped the way we fight fires today, but for someone like me who doesn't know much about how those fires are fought and isn't all that familiar with fire policy, the ending seemed a little bit rushed, especially in contrast to the thorough job he does of laying out the political climate of 1910 and the richness of the stories he tells. I reserved Let the Great World Spin from the library three times before I actually got around to reading it. Over the last year, I also had it in my actual shopping cart at Target and in my virtual shopping cart at Amazon. I knew it was a book that I wanted to read in theory, but for some reason I really didn't want to sit down and open this book about New Yorkers in August of 1974, when Philippe Petit walked between the towers of the World Trade Center on a tightrope; New Yorkers whose lives became inextricably bound. The first section of the book confirmed my suspicions-- it was a hard storyline, something that didn't resonate with me and something I really didn't want to know more about. But I persisted in reading the story of hard-edged prostitutes working in the South Bronx and the priest who watched out for them. The book is written as a series of stories about New Yorkers, and it's not until late in the book that the stories start to come together, that the "six degrees of separation" element starts to take shape. The later stories helped me understand and appreciate the earlier ones. Let the Great World Spin isn't a book to read quickly, to rush through. The prose is beautiful, and I found myself consciously telling myself several times to slow down and savor it. I guess some readers may think that the interconnectedness of the characters is somewhat improbable, but I found the idea that there are binding ties and connections between people of widely varying backgrounds to be really comforting. The last chapter of the book is one of the most beautiful things I've ever read. Slowly.